Spin the wheel and win your fortune in this incredibly easy slot game. Click here to play! Gold bars, 7s, and Diamonds are your best friends as the wheel keeps on spinning. Play the Wheel of Chance today across three wheels and a single pay-line. There is nothing better than the simplicity that Wheel of Chance has to offer, and you can win incredible amounts of cash. There is a great Bonus Round to play when you spin up the Bonus symbol on a three-coin play. 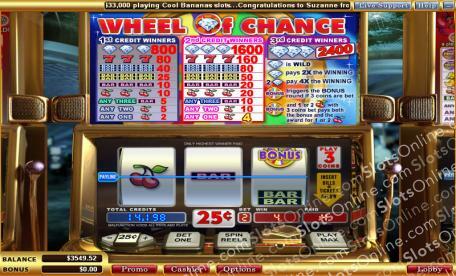 And since it is a single pay-line game, you'll know exactly what you've won as soon as the reels stop spinning. The Diamond is a Wild symbol and will reward you greatly if you manage to spin one up. If, however, you get three Diamonds you will earn yourself 2400 times your original wager. Play the Wheel of Chance and make sure your spin up the diamonds for the ultimate payout experience. Diamonds are wild in Wheel of Chance and will pay out up to 2400 times your initial wager when you spin three of them at once. Spin the Bonus Round wheel on on a three coin bet and you will be sent straight to the bonus round where you can win a jackpot worth thousands of dollars.